In my effort to deal with this problem, I finally found a solution that works. Most anti-spam solutions work by evaluating emails one at a time to look for patterns that are associated with spam. It sounds like a good idea but it doesn’t work very well. If your settings are too aggressive there will be many “false positives” – good emails that end up in your spam folder. 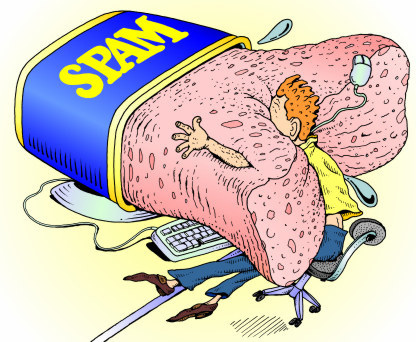 If you are not aggressive enough, too much spam gets by the filters and ends up in your inbox. Even then, you still need to scan the spam folder for false positives, which really defeats the purpose when you think about it. Enter a product called Cloudmark DesktopOne. This product is not only highly effective, but it is also free to use. DesktopOne takes a completely different approach to spam detection. DesktopOne uses a “honey pot” approach to build its spam database. With this method, they set up email addresses that exist only for the purpose of attracting spam. The beauty of this approach is that it invites the spammer to use his own weapon to blow himself up (see Shakespeare above). Spammers go to great lengths to acquire email addresses, gathering them using automated “bots” to scour the web. Once collected, these email addresses are targeted by the billions on a continuous basis. Spammers unknowingly collect honeypot email addresses and send spam to them. Because these addresses have no purpose other than identifying spam, any email that goes to a honeypot is automatically known to be spam with 100% certainty and goes into the database – no legitimate email will ever find its way to a honeypot address. In addition to the honeypot method, DesktopOne also supplements its spam database from the collective contribution of their over one billion users. DesktopOne is incredibly accurate in spam detection. In my experience it is very close to 100% accurate, with zero false positives and only a very rare miss that does not get detected (and of course I flag it as spam for the benefit of other DesktopOne users), and this amazing accuracy is achieved without any costly pattern recognition processing. The process is very fast and the spam database resides in the cloud so it does not need to be downloaded and stored on your computers. Cloudmark offers versions for both Windows and Mac computers, and DesktopOne works both with POP/IMAP clients (e.g., Outlook) as well as Gmail and Yahoo although I have not tested the latter. The basic version is free and is good for a single email account on one computer. If you have multiple email accounts they offer a “pro” version at an annual cost of about $20. Full disclosure: Computer Problem Solvers has no relationship with Cloudmark and is not a reseller of their products. Our only interest is in our shared disgust with spammers, and our desire to help our customers fight the scourge of spam email and the spread of computer infections that arise from spam. As with any third party products, we can only report on our experiences and cannot control your actual results.